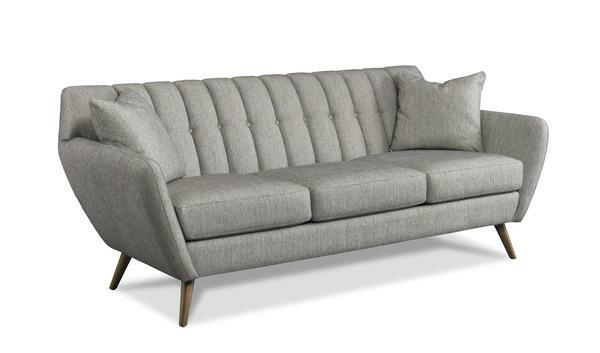 Let an updated retro style like the Isaac Sofa by Precedent grace the living room with stylish and comfortable seating. Isaac is clean and simple, yet offers distinguishing features that make it a true stand out. Mid-century modern elements rest in this design, with wide, outstretched sofa arms and slender, cone-shaped legs. The sofa back is channeled with precision, with a single line of button detailing creating the clean lines contemporary style furniture is popular for. Precedent furniture always combines maximum comfort in a durable and stylish presentation. Precedent has been making fine furniture for over thirty years. They guarantee their frames for life and cushions for two years. Get to know Precedent style in these video clips shot in Sarasota, Florida at the DutchCrafters Store. Our team of Furniture Specialists is ready to answer your questions. Contact us via email or phone today. We thank you for shopping with DutchCrafters.